iRich Club Travels with You on Your Every Journey! STEP 1Present your iRich Membership Card upon making a purchase. STEP 2Scan your membership barcode and accumulate your iRich Points! STEP 3Redeem exclusive gifts with your iRich Points. If the mobile device is not presented upon making a purchase, a claim of the iRich Points can be applied within 7 days of the purchase. ※If the claim is not applied within 7 days of the purchase, the amount of the purchase and the iRich Points will not be eligible for accumulation. Members upgraded to Ithuu membership and Cidal membership can enjoy extra exclusive courteous receptions that allow you to enjoy dignified services. Members upgraded to Ithuu membership and Cidal membership can enjoy extra exclusive courteous receptions that allow you to enjoy dignified services including VIP Reception, Free Shuttles to Downtown Stores, Airport Pickup & Drop-off, Customs Clearance Service by Huan Yu VIP Terminal, Invitation to Elite Events, Golden Lake Hotel and Discovery Hotel accommodation vouchers, meal voucher for designated restaurants, and other rewards. Accumulated bonus iRich points can be used to redeem for Ever Rich Shopping Vouchers, multi-store Food/Drink Vouchers, star-rated hotel accommodation vouchers, and a variety of good gifts! 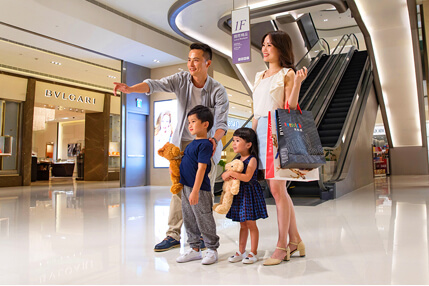 Accumulated bonus iRich points can be used to redeem for Ever Rich Shopping Vouchers, multi-store Food/Drink Vouchers, star-rated hotel accommodation vouchers, exquisite afternoon tea sets or deluxe buffet vouchers. Also, there are a variety of other good gifts including Airport Pickup & Drop-off service and round-trip tickets to Asian destinations! iRich Digital Membership Card can be used at Ever Rich, Profond and Kingfond Duty Free stores to accumulate your iRich Points; cannot be used with other accounts. Coming soon - more stores will have the system update to support the new iRich app. * For relevant attentions and instructions, please refer to the Announcements.